The accuracy and clarity of measurements are the hallmarks of all sports fields, especially those where the competitions and championships are held. When determining the size of the future sports field, it is necessary to know its generally accepted playing and construction dimensions, as well as the rules according which the marking of this kind of field is made. It is important to pay attention to the orientation of the field, thus during the hours of its maximal use, the sun should shine mainly from the side. Another important aspect is the material and stability of the field's coating, and the quality of other items used in its construction — stands, nets, baskets, etc. The best way to represent all these details is to make a detailed plan. Construction of sport complex, playground, sport school, sport ground and fields for different kinds and directions of sport assumes the creation of clear plans, layouts, or sketches. In many cases you need represent on the sport playground layout plan the multitude of details, including dimensions, placement of bleachers, lighting, considering important sport aspects and other special things, as well as to plan the surrounding territory. It is incredibly timesaving and convenient to use professional Sport Field Plans solution for ConceptDraw DIAGRAM software and ready-made vector objects when depicting any of your playground ideas and drawing plans for various sport fields — for football, basketball, volleyball, golf, baseball, tennis, etc. You can also display in detail the accomplishment of the fields surroundings, the placement of pool and green vegetation, adjacent car park, children's playground, and other useful facilities. Now, arrange the players on the field and you will get a realistic model of the game. Sport Field Plans solution extends ConceptDraw DIAGRAM with samples, templates and libraries of design elements for professional drawing the sport field plans and developing layouts of sport fields, recreation areas, and playground layouts plans. Depict all your playground layout ideas easily with ConceptDraw DIAGRAM, and decisively implement your playground layout designs. Use the final colorful, strict and accurate ConceptDraw's playground layouts when designing the building documentation, brochures, booklets, advertising materials, sports editions, sport maps, business plans, on web sites of sport complexes, sport centers, hotels, etc. There are 3 stencil libraries containing 61 vector graphics for Sport Field Plans solution. There are a few samples that you see on this page which were created in the ConceptDraw DIAGRAM application by using the Sport Field Plans solution. Some of the solution's capabilities as well as the professional results which you can achieve are all demonstrated here on this page. All source documents are vector graphic documents which are always available for modifying, reviewing and/or converting to many different formats, such as MS PowerPoint, PDF file, MS Visio, and many other graphic ones from the ConceptDraw Solution Park or ConceptDraw STORE. The Sport Field Plans solution is available to all ConceptDraw DIAGRAM users to get installed and used while working in the ConceptDraw DIAGRAM diagramming and drawing software. This diagram was created in ConceptDraw DIAGRAM using a wide selection of libraries from the Sport Field Plans solution and “Trees and Plants” library from the Site Plans solution. An experienced user spent 15 minutes creating this sample. This sport field plan sample shows how one might arrange all aspects of a baseball field, also called a baseball diamond, from the positioning of the bleachers and lighting, through to the organization the adjacent car park. It depicts in detail the structure of the baseball field and its marking, the layout of fan benches and lamp posts, as well as the location of trees and parking with cars. Making the calculations of the maximal number of fans in the stands, we can take a conclusion about the required number of parking places and, if necessary, design and organize an increased parking lot. Don't forget about the details, such as the landscape design and lighting around the field. The use of ConceptDraw's Sport Field Plan solution allows you to visualize the large-scale projects such as this in a matter of moments, and convey your plans to others in an effective and striking manner. This diagram was created in ConceptDraw DIAGRAM using a wide selection of libraries from the Sport Field Plans solution and “Trees and Plants” library from the Site Plans solution. An experienced user spent 10 minutes creating this sample. This site plan sample demonstrates the accomplishment of the recreation area which is an open space supposed for the rest, both active or passive. The recreation areas can be the park areas specially planted by people or some parts of nature separated and existed under the human's protection, and guarded by law, sometimes including water sources, rocks, multifarious flora and fauna. The recreation areas can be located separately or near private houses, multi-floor buildings, hotels, resorts, medical centers, etc. The layout of a pool area, location of the barbecue zone, bench, lighting fixtures, and certainly green plants, flowers, grass are thought-out on this plan. The similar plan can be created in just a few minutes through the tools of ConceptDraw DIAGRAM. With a variety of different customizable objects and features in Sport Field Plans solution, you can make your plan as simple or as complex as necessary, can mark the location of the playground, training area, etc. This diagram was created in ConceptDraw DIAGRAM using a wide selection of libraries from the Sport Field Plans solution. An experienced user spent 5 minutes creating this sample. This sample shows how one might arrange a basketball court and its surroundings, where to locate the fan benches and street lights. It is well known that a basketball court has the rectangular form, defined scheme of arrangement and specified dimensions, includes one basket at either end and the marking made in accordance with certain rules. The court's dimensions can vary from the 94 by 50 ft (28.7 by 15.2 m) according to the NBA standard, 91.9 by 49.2 ft (28 by 15 m) according to the FIBA norms, to the smaller sizes when there are constructed the amateur basketball courts. But the baskets are always on the hight of 10 ft (3.05 m) above the floor that can be concrete or asphalt in the case of an outdoor court, wooden or from other solid material, when organized indoors. By combining various libraries from the ConceptDraw Solution Park, you can add features such as seating, vegetation and lighting. This diagram was created in ConceptDraw DIAGRAM using a wide selection of libraries from the Sport Field Plans solution. An experienced user spent 10 minutes creating this sample. This sample illustrates the sport playing areas constructed for playing varied sports and is convenient for their visual comparison. Being designed on the base of the Wikipedia file "Comparison sport playing areas.svg", it represents the cricket pitch, ice hockey arena, Olympic-size swimming pool, tennis court, basketball court, volleyball field, badminton and squash field, table for the table tennis, ten-pin bowling space, gymnastics vault, shot put room, area for the gymnastics floor exercises, taekwondo / judo ring, boxing / karate ring, and some others. You have a perfect ability to compare the size ratios of these fields. It’s very useful when you plan the building of the sport complex, sport center, sport school. Having a field plan you can immediately understand how much space is required for its arrangement, count the required quantity of materials, summarize the estimated costs, etc. The high resolution ConceptDraw's graphics are perfect for the large-screen presentations. This sample designed in ConceptDraw DIAGRAM on the base of the Wikipedia file "Football pitch metric.svg" demonstrates the football pitch or the soccer field, and its metric details in the scale. There are displayed the sizes of the football gates and penalty areas, the radiuses of circles of the marking near the penalty areas and the center circle. The football pitch dimensions and markings are defined by the set of the Game Laws at the chapter "The Field of Play". The football pitch has a rectangular form and its standard preferred size is considered as 105 by 68 m (115 by 74 yd), but there are met different variations. Thus, for the international matches, the field dimensions must be obligatory strictly adhered. All parts of the football pitch are also named on this sample. It is very useful plan for construction and marking the new football pitch, organization the stadium and holding football matches. This sample illustrates a detailed plan of the volleyball court and is based on the Wikipedia file "VolleyballCourt.svg". There are shown all dimensions of the court on this diagram. The common dimensions of the volleyball court are 18 m by 9 m (59 ft by 29.5 ft). It is rectangular court divided by the grid into two equal square parts of 9 by 9 m each one. The height of the grid's location is different for men's and women's volleyball game: 2.43 m and 2.24 m correspondingly. The line placed on the distance of 3 m from the grid and parallel to it, is considered as the attack line. ConceptDraw DIAGRAM software is a very convenient tool for designing similar plans. Adding to this plan the players allows modeling the game, illustrating the volleyball rules, describing different game situations, illustrating the winning positions and game's secrets, predicting results in varied cases, etc. This plan sample shows the garden space and illustrates the layout of two swimming pools — small for children and a large one, outdoor lights, paths, trees and bushes on the outdoor fitness area. Very often the pools are located not only on the territory of hotels, health clubs, Spa complexes, recreation centers, sanatoriums, fitness centers, private clubs, and private homes, but also on the territory of various sports complexes, sports facilities, near the sports fields of different purposes — football, basketball, volleyball, tennis courts, etc. The Sport Field Plans solution and other solutions from the ConceptDraw Solution Park provide you with a full range of tools necessary for drawing detailed plans of internal and external territory including all necessary attributes for sport and recreation — sports fields, sports grounds and pools. They also allow depicting the plan of arrangement of other details — the green area, landscape design, recreation area, fountains, ponds, children playgrounds, and others. This sport playground plan sample depicts the layout of recreational equipment on the play area. The playground is specially allocated and equipped area for children playing. Typically, it is fenced with the purpose of safety and ability to play the children of different ages, from the smallest ones. The sport playgrounds are one of the subtypes of the playgrounds. The modern playgrounds offer a lot of different playing equipment, among which the sandboxes, seesaws, swing sets, merry-go-rounds, slides, playhouses, mazes, play complexes, and so on. As for the sport playgrounds, they are equipped with multifarious recreational equipment and gym equipment that assist children, teenagers and adults in developing strength, physical coordination, and flexibility. There are arranged many dissimilar sports equipment and gym equipment on any taste on this playground sample. Use ConceptDraw's Sport Field Plans solution to plan your playgrounds, sport playgrounds, sport fields, recreation areas, rest areas, adjacent territories, etc. This diagram was created in ConceptDraw DIAGRAM using a wide selection of libraries from the Sport Field Plans solution. An experienced user spent 15 minutes creating this sample. This sample demonstrates the plan of the open-air sports complex, which typically groups the set of sports facilities equipped with sports equipment. 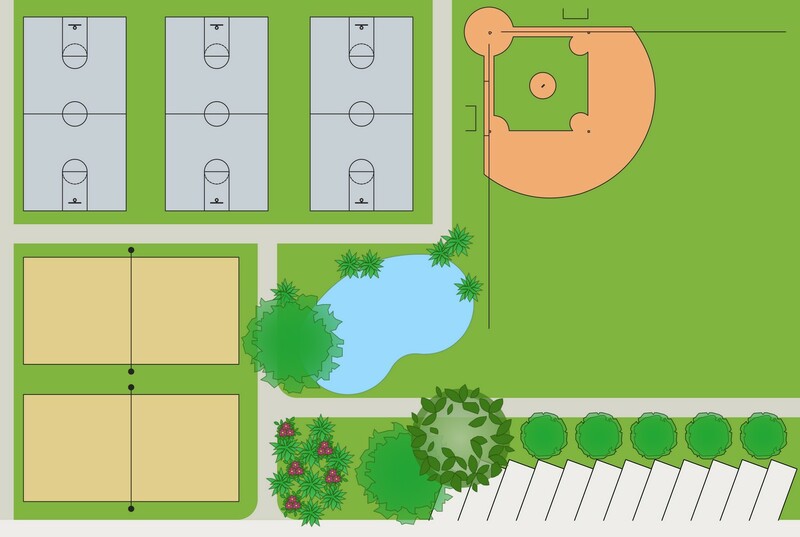 This example represents the layout of the basketball and tennis courts, baseball diamond, swimming pool, green zones with grass, trees and bushes, and parking near the outdoor game playing area. The location of the areas for varied sports games is carefully thought-out and planned on this diagram, and while it is on the stage of development and planning, it can be easily changed and redrawn at any moment. Perhaps, at some moment you would like to change some of your fields to other ones, to add sports equipment or the play area for children. It's also easy with ConceptDraw DIAGRAM. It assists you in designing your diagrams strictly, accurately and symmetrically. All repeated fields are located on equal distances from each other, the largest space is reserved for the baseball field. This diagram was created in ConceptDraw DIAGRAM using a wide selection of libraries from the Sport Field Plans solution. An experienced user spent 20 minutes creating this sample. This sport field plan sample illustrates the badminton court arena. The commonly accepted form of the badminton court is rectangular and divided into two halves by a net, fixed on the hight of 1.55 m (5 ft 1 inch) at the edges and 1.524 m (5 ft) in the center. During the game, the players hit a shuttlecock with the racket strikes to throw it across a net to the opponent's side and to prevent it from falling on their own side. In some cases, there are equipped the badminton courts for the pair games, which are wider than regular ones. Typically, the width of the badminton court is 5.18 m (17 ft) for the single play and 6.1 m (20 ft) for the double one. The length of the court is 13.4 m (44 ft). At the distance of 1.98 m (6 ft 6 inch) from each side of the net are marked the short service lines, the zones between service lines and back lines are named the service zones, the center line divides them into the right and left service courts. Both ConceptDraw DIAGRAM diagramming and drawing software and the Sport Field Plans solution can help creating the building plans you need. The Sport Field Plans solution can be found in the Building Plans area of ConceptDraw STORE application that can be downloaded from this site. Make sure that both ConceptDraw DIAGRAM and ConceptDraw STORE applications are installed on your computer before you get started. After ConceptDraw STORE and ConceptDraw DIAGRAM are downloaded and installed, you can install the Sport Field Plans solution from the ConceptDraw STORE.